The Sawtooth Renaissance Players – Medieval Rebirth in the Treasure Valley. Medieval Rebirth in the Treasure Valley. Welcome to the Sawtooth Renaissance Players website! We are an Idaho-based group with a shared passion for all things renaissance. We’re glad you’re here! We are always looking for new people to share in the fun. But what do we do, you might ask? First, about the people. Our group is filled with people of all ages that come from a variety of backgrounds with a hugely varying skill-set. We have those who are trained in stage combat, those who have been involved in musical theater their whole lives, those who are trained musicians, and more! There is a piece of history, of the renaissance lifestyle, that everyone can relate to. No matter what skills you have, there is room to develop them (or start new ones) ! Next, what we do. We are a floating group of “players”, which means that we provide atmosphere, immersion, and entertainment in a variety of settings. Some members perform choreographed swordfights with live steel at events ranging from Ren Faires to Fandemonium. Some members provide mini-tutorials at Faires about things like textile weaving. Others spend their energy perfecting a character so that visitors to a ren-faire can meet people that seem to be from that long-gone era, whether this be through music, old religion, or almost anything else. 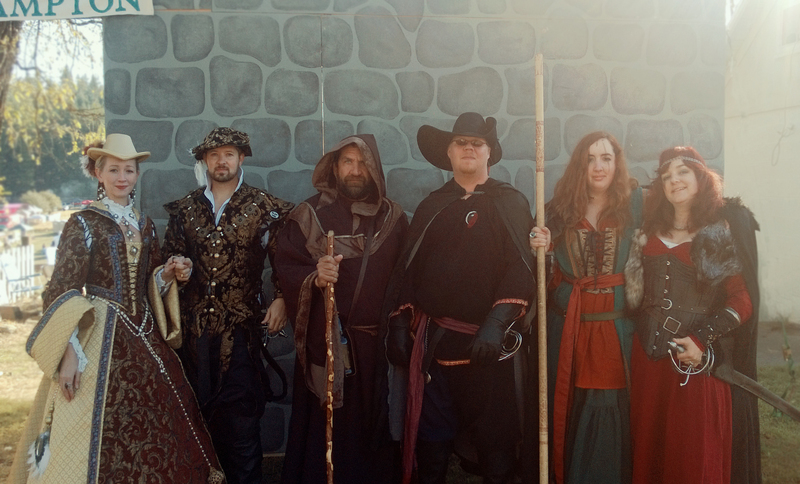 We collectively visit several local faires throughout the year, but we also travel to others, two notable ones being the Spokane Renaissance Faire and the Greenwood Faire. As we expand, other travel options will be within our grasp! Now, about this website. We have a ton of resources available, so feel free to explore all the tabs above! For firsthand accounts of our faire experiences, visit the “Stories of the Past” link under “The Players.” Need some help finding something specific for your character? Look under “Renaissance Resources”. The Gallery has pictures from our adventures, and the page titled “Join us!” is the place you want to go to send us a membership inquiry. June may be best known for being the wedding month, but for Richland, Washington it means another Greenwood Renaissance Faire! Time travel to the Elizabethan period with a trip to a beautiful park set on the banks of the Columbia River. Enjoy a family day at the faire by eating turkey legs, watching period performers, and even try your hand at splashing someone in the stocks. Ale and Rum not your cup of tea? Greenwood presents a lavish brewing booth that you can get honey ale, root beer, or even cream beer! All non-alcoholic for the younger patrons of the faire. Or walk next door to grab a coffee beverage or Italian soda. Not thirsty, how about watching some of the entertainers? Seattle knights make a smash hit at Greenwood with their live jousting and melee fights. Cheer for your favorite teams as you watch them battle it out to see who wins. Or sit down to enjoy a Shakespeare play at the Queens stage. 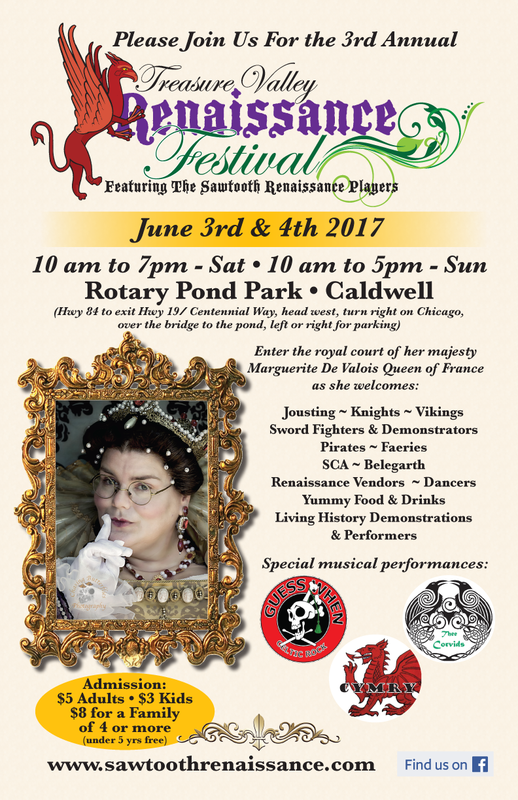 Just be ready to bow and shout “God save the Queen” as she makes her rounds about the faire. How about a laugh at the puppet show, comedic magicians, or daring to assist in a jugglers show? Move your hips with the exotic beauty of the belly dancers, clap with the English country dancing group, or sing along with the musicians and choir. There are spectacles for all ages. If you have ever wanted to know what it would be like to be part of the royal guard, just grab a lance and join the march as they parade around the faire and teach you the guard routine. Maybe you are looking for the finishing touch to complete your renaissance costume? No problem! With venders selling gloves, hats, belts, vests, skirts, pouches, or even a critter to sit on your shoulder you can’t go wrong. Or buy a completely new outfit that is renaissance accurate. Greenwood presents an atmosphere that leaves the modern world outside of your thoughts. From the renaissance enthusiasts in full costumes, to the ladies needle working, to the blacksmiths hammering away, your time travel feels complete. Celebrating their 28 year, they certainly know how to portray the 1580’s over seen by the regal Queen Elizabeth herself. Although we are not invited to this faire for the superb fighting troupe that we are, our presence is still very much need. Greenwood Faire can host as many as 8 different stages, and someone needs to make sure the performers don’t run wild. Starting our travels on the Thursday before the faire, we traverse to Richland and arrive at Three Rivers just in time to camp out at the park. We rise and sort of shine to help the Greenwood Players create their Elizabethan time travel. After a full Friday of work, we are finally all set for our audience! Manning the stages is about more than just getting after artisans for running over their allotted time, but also being part of the faire’s atmosphere. We sit with the audience and participate in helping establish that they have set foot into another world. And if the Queen decides to make an appearance at your stage, be sure to have a loud enough voice to stop the show. Just a tip, you might get in trouble if the Queen hears you yelling “God shave the Queen!” After two hard days of watching musicians, jugglers, actors, and a wide array of Elizabethan performers, it’s time to pack up and go home. After sleeping in tents at the park for three nights, we are all calling for our beds. Thus begins the trip home and a 2 am arrival at the treasure valley. Looking forward to next year! In the summer of 2013, our fight group, The Royal Dragoons, was invited to travel in the fall to the Spokane Renaissance Faire to assist with stage management. Our Fight Master Adam Edminston and other members of the Royal Dragoons have travelled to the great and mighty Greenwood Faire several years running to assist with stage management and have earned a reputation as a capable team. Many of those among us who had never had the chance to go to the Greenwood event volunteered eagerly for the Spokane experience! Fast forward a couple of months, and events were conspiring against us. Adam wasn’t going to be able to take the time off work to go to Spokane, nor were the other ‘veterans’, for similar reasons. The six of us still signed on for the trip had to make a decision: were we willing to go and try to handle the stage management for the Faire despite our utter lack of experience? And the Spokane folks were willing to give us a trial run. Bless their trusting/desperate? hearts. Accordingly, on Friday October 4th, 2013, six untried members of the Royal Dragoons loaded into one tan minivan. Being that this vehicle carrying six adult passengers, we took with us only the bare bones of Renaissance Faire survival—the clothes on our backs, snacks for the road, and you know, swords. And boots. And corsets, doublets, capes, daggers, and breeches. A 7 foot quarterstaff. And a parasol, a couple of fox tails, half a dozen swords, and one dainty sixteenth century straw hat in a box. Morale in the van was running high for the trip up to northeastern Washington. We drove through gorgeous autumnal mountain landscapes and listened to the entire soundtrack of The Phantom of the Opera (most of us willingly). We discovered that Brad has a fine baritenor singing voice, that Jeremy was very close to his grandparents growing up, and that Tiffany does not approve of cliff edges, among other things. Somewhere after the Washington state line we began pre-arrival celebrations by car-dancing to the throbbing vibes of “We are Young”. Apparently unlike Andrew Lloyd Webber musicals, we all like the band Fun– at least at midnight while heavily caffeinated after eight hours in a vehicle. Well after midnight we rolled into Spokane and parked on Lena Cooley’s curb. We had our first glimpse of our hostess, the Spokane Renn Faire’s official ‘Faithful Squire’, for the first time when she crept out to greet us in her jammies with sleepy eyes after being rudely awakened by our tromping about. Nights are short for Renaissance Stage Managers, alas. But we eagerly scampered from our comfy beds and donned our period attire, dancing around each other in the two bathrooms and helping each other lace up corsets. The brilliant sunny day was before us, and with a high degree of trepidation/excitement we set out in our faithful tan minivan for the Faire Grounds. My personal experience with Renaissance Faires is limited. As in, Spokane made three total. However I feel completely qualified to assert that a more picturesque location than that of the Spokane Faire could scarce be found. Steep rolling mountainsides clad in dark green firs and brilliant gold and red autumn foliage surround an idyllic little valley, where the Faire sets up camp in a wide meadow. There is no running water, no electricity. Just birds singing and people laughing (in English accents, of course) and the scent of horses and pine trees. It’s pretty perfect, yeah. We were quickly given our assignment for the day: manage all four of their stages for the duration of the day. That meant making sure that none of the performers were double-booked, that they all were present and prepared ten minutes before they went on, and that they were all kept in high medieval spirits. And that was all before noon, the first day. We spent the two days of the Faire learning alongside our performers about stage management. We ran up the steep hill to the tavern and back down countless times (and not for the ale), swapped performers and adjusted schedules and held a hundred hasty conferences. We grew sun burnt and footsore, gobbled delicious scones and assisted bee-stung children, and spent hours laughing at the marvelous wit of comedy troupes, being astounded by fire-dancers, and relaxing to the beauty of medieval choral singing. We saw live mounted knights joust in full armor unhorse one another, were treated to marvelous Celtic music, and enjoyed truly excellent ad-lib acting all throughout the Faire. All this, while making new friends, exploring the Faire during our breaks, reveling in the lively atmosphere, and being treated with appreciation and respect by the people we’d come to work with. The feeling of enjoyment and camaraderie which we experienced throughout the weekend among the cast and crew culminated with an end of Faire gathering up in the Tavern on the hill, with wild Celtic music, dancing, drinking, and laughter! The Directors thanked their cast and crew and entertainers profusely, and there was time for anyone who wished to share their best memories of the weekend—which finally had to be cut off after a half hour because, well, we just all had SO MANY good memories! For myself, it was the most positive, truly inspiring Faire experience I’ve yet had. Our group was treated with such hospitality and generosity that it’s hard to overstate it. The Faire is relatively small and new, but it has wonderful atmosphere, excellent variety of entertainment and merchants/vendors, and the crew really seemed to pull together and have fun, and that is what makes a Renn Faire wonderful for the patrons! Most of all, our little group of six had an opportunity to work together, and to walk away from it feeling we had learned, we’d grown, we’d done our job well, and we knew each other and liked each other even more! We were invited to come back and do it again this coming Fall, and I wouldn’t miss it for the world! 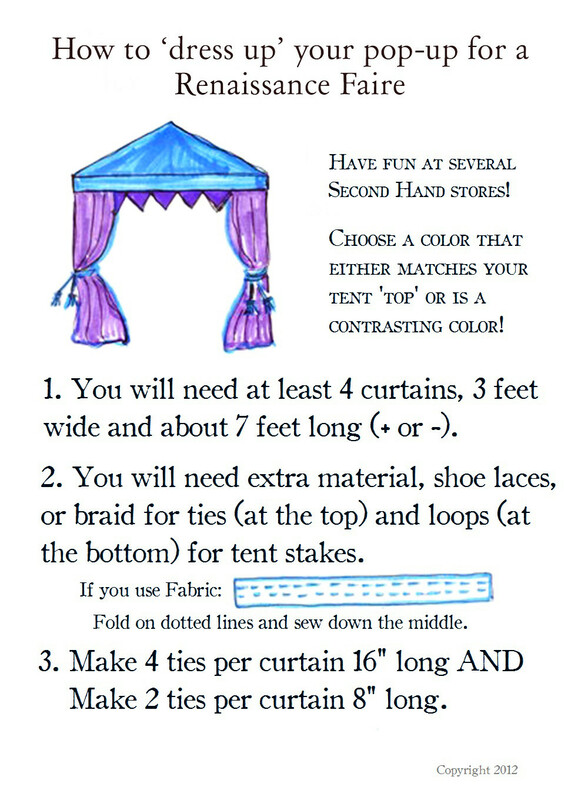 Do YOU have a pop-up tent you recently acquired? Do you love it, shiny and new in all its glory? Don’t love it. It doesn’t deserve your love. Not yet. The following tutorial by our Lady Director Dawn Russell will give you all the info you need to transform your naked pop-up monstrosity into something worth looking at. That should do it!!! Now your tent is ready to be gazed upon. Better yet, it looks like it ACTUALLY FITS in a renaissance setting. You’re practically a magician. 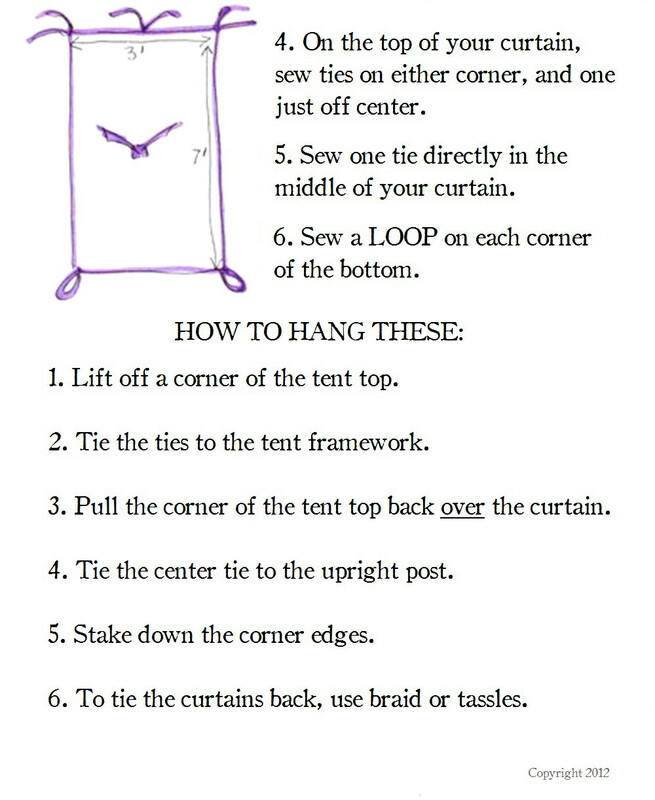 If you would like to reference this tutorial at any time, you can also find it in the Renaissance Resources menu under the title Tent Dressing. Logo ideas and voting on stuff will all be in the “members only” page from here on out. the Renaissance Resources page will have some drop down pages for extra fun stuff to look at. This includes Costuming, Music, Steampunk (DIY!!! ), and whatever else comes to mind. There should be statements, articles, and tutorials coming soon as well. For now, consider everything as a work in progress! Tomorrow at our meeting we’re going to have an official logo voted into place. Check for updates! Treasure Valley Renaissance Festival Rotary Pond Caldwell, Idaho June 2017 Eagle Fun Days Parade Eagle, Idaho July 2017 Indian Creek Festival Caldwell, Idaho August 2017 Kid Fest! Kleiner Park, Meridian August 2017 Boise Highland Games Garden City, Idaho September 2017 Spokane Renaissance Festival Lazy K Ranch Colbert, Washington October 7&8 2017 More dates to come! As we start this New Year we also begin our theatrical practices. These will be held weekly at the home of the Bertsch’s: 1603 Sunset Ave Caldwell, 83605, starting at one o’clock. Nonmembers are welcome to attend and take part in these as a prelude to joining (not required if you attend) the group or helping with the Treasure Valley Renaissance Festival. Sword practice shall start when the weather permits for outside practice. We will keep you posted.